THE CREW 2, sequel to 2014’s open world racing game, is now set to launch on March 16th, 2018 for PC, PlayStation 4 and Xbox One. 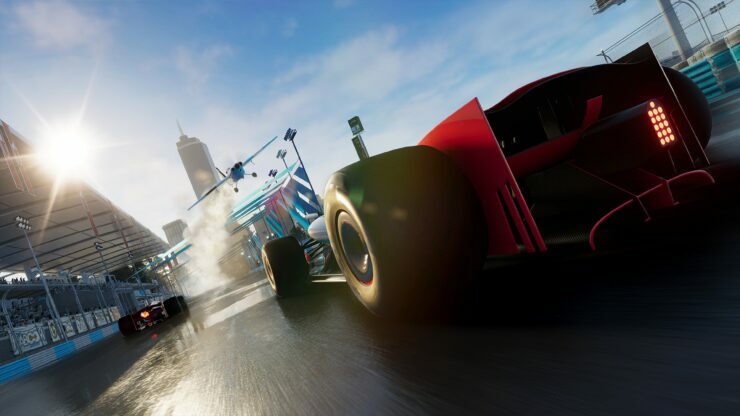 During Gamescom 2017, Ubisoft shared with the press a developer Q&A which delves deeply into the new features and motorsports disciplines added to the game. Check it out in its entirety below, alongside new screenshots and the first gameplay trailer. What is THE CREW 2? THE CREW 2 is the newest iteration in the revolutionary open-world driving franchise The Crew. Capturing the thrill of the American motorsports spirit in one of the most exhilarating open worlds ever created, allowing players to put their skills to the test in the widest range of motorsport disciplines, featuring all kinds of cars, bikes, boats and planes. THE CREW 2 opens up the entire USA to non-stop competition and no-limit exploration, for the players to becoming a champion of Motornation, a huge and living open world USA, shaped for motorsports. What are the key innovations of THE CREW 2 in comparison to THE CREW? The world of THE CREW 2 is Motornation: a huge, beautiful and living open-world recreation of the USA, shaped for all motorsports. It’s a world where 4 different families have emerged to celebrate the American motorsports spirit, in their own special way: Street Racers thrive in over-the-top urban competitions, Pro Racers live for the perfect line, Off-Road explorers take off on adventure and Freestylers improvise the craziest tricks. This colossal and action-packed land of opportunities is deeply inspired by today’s vibrant motorsports reality. 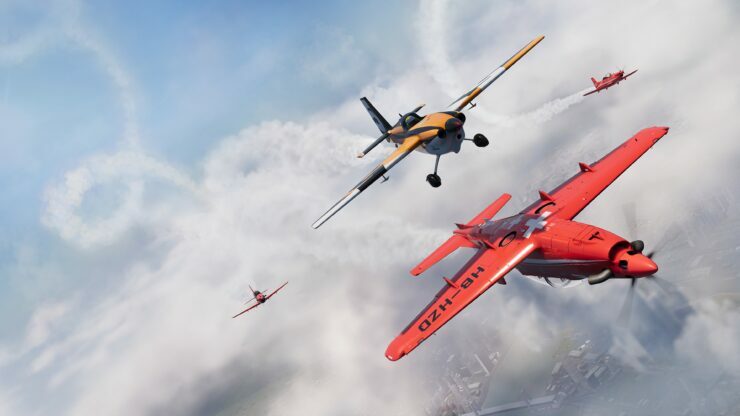 In THE CREW 2, competition has evolved to include more and more vehicle types and disciplines, taking the challenge on land, in the sea and in the sky. THE CREW 2 offers an innovative, completely seamless game experience, keeping loading screens and menus to a bare minimum and introducing features like the Fast Fav, allowing players to switch from their favorite cars, bikes, boats or planes with the press of a button. It gives players a fresh sense of freedom and unleashes the game’s full potential for fun and craziness. THE CREW 2 is telling your very own story, providing a fully tailored game experience. The player is at the center of his own adventure, completely free to choose his unique path to become a motorsports champion. What are the team’s inspirations? THE CREW 2 is deeply inspired by today’s real-world motorsports, specifically in the US. Not only in the way competition has evolved to include more and more disciplines, but also in the way fans see their passion and live it on a daily basis. American motorsports have always had a reputation for pushing the envelope – unconventional disciplines like Monster Truck and dragster racing are the proof of that. And in today’s connected world, it has become the most vibrant and innovative scene. Anyone can invent new ways to challenge themselves and the engine, record their performance, share it worldwide and make it the next big thing. This world is free, unpredictable, action-packed and most of all, inclusive. Anyone can join and anyone can steal the spotlight. This is what we recreated in THE CREW 2, this is what we call Motornation. What is the game’s creative vision? The world of THE CREW 2 is a brand new take on the USA. Called Motornation, it’s the place where the passion for all motorsports meet beautiful and diverse settings, the perfect country for fans and champs to gather and celebrate the American motorsports spirit. It is huge and action-packed, but most of all, it is perfectly shaped for an incredible variety of disciplines, from street racing to aerobatics and rally raid, to name just a few. For each of those disciplines, there are perfect spots all across the US. This is where you’ll take part in high-octane contests, testing your skills on all kinds of terrains, taking the challenge on the ground, in the sea and in the sky. And of course, drivers are totally free to discover this great open world on their own terms, behind the wheel of their favorite ride, solo or with their friends. Like in real-life, one is never really done exploring the USA! What are the motorsports families and what is their role in THE CREW 2? There are 4 motorsports families in THE CREW 2: Street Racing, Off-Road, Pro Racing and Freestyle. They each represent a different way to live the passion for motorsports, with a unique culture, style and objective. They’re scattered all over the country, taking over iconic places and terrains that match their specific needs, shaping the entire USA into a world of challenges and opportunities. Take the Street Racing family, for example. Street Racers own the cities. Showing off in heavily customized rides, finding new ways to ride in style. In Motornation, street racing comes with a twist: it isn’t about just losing the cops anymore, but transforming the whole city into a place of open competition. 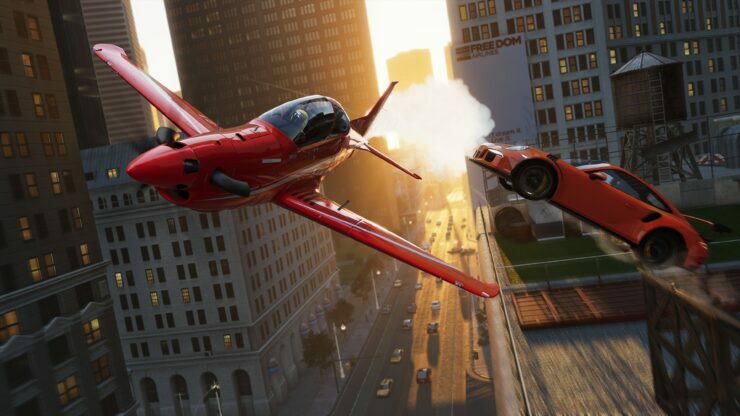 That means the possibility to cross buildings through shortcuts or by driving on rooftops, and a few elements of surprise like ramps that will allow players to do tricks and gain speed, and more generally an unconventional urban planning tailored for street racing disciplines. 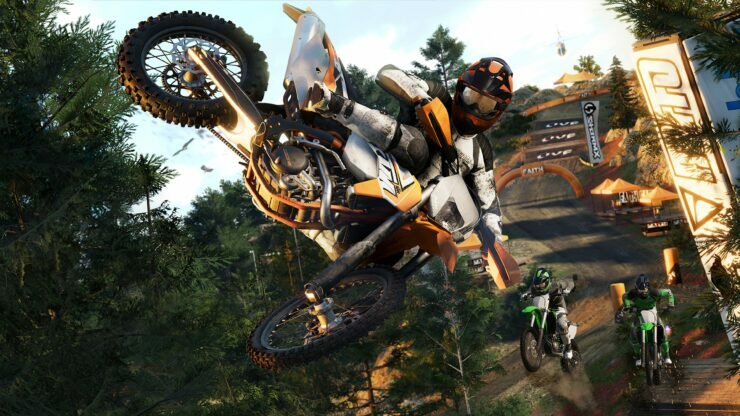 We’re also showing a bit more of the Off-Road motorsports family this week at Gamescom. Off-road is really about going off the beaten track, admiring but also taming nature. In some cases, like in Rally Raid, it means you have to forge your own path across the wilderness to the finish line, while Motocross takes place on specific playgrounds where the terrain has been shaped to allow jumps and some heavy two-wheel challenges. This same logic applies to all 4 families, but we’ll share more information about them later. How is the player experience different in The Crew 2 compared to The Crew? In THE CREW 2, the players’ ultimate goal is to become a champion of Motornation. The way they achieve that goal is entirely up to them, though. Every time they will compete, explore and challenge themselves and others, they will climb up the ladder of fame. They’ll get some inspiration among the 4 motorsports families and get their hands on a wide variety of disciplines. They are free to favor one or all of them, to travel solo or with friends. The important thing is they find their style, hone their skills and get a name out there. In this world taken over by engines, LIVE is the #1 motorsport contest organizer, as well as the main sponsor and media channel dedicated to all things motorized. The Live Xtrem Series, which is the demo players will be able to complete on Ubisoft’s consumer booth this year at Gamescom, is a good example of how LIVE can show up in-game, with the sportscast’s voiceover, the up-beat and fresh mood of the competition as well as a few surprises that we won’t spoil for those of you who haven’t tried it yet. Ivory Tower, Ubisoft’s Lyon-based studio celebrating its 10th anniversary this year, is leading the development on THE CREW 2. The studio has been founded by seasoned veterans from the gaming industry and is now a hundred talents strong. We are internationally renowned for our expertise in the Driving genre and more generally for the ambition of our productions. With THE CREW, we’ve proven successful at building massive immersive open worlds and developing online infrastructures and services. For the past two years, we’ve been renewing and expanding the experience through events, features, monthly patches and two expansions: The Crew Wild Run and The Crew Calling All Units. THE CREW has since then reached and surpassed 12 million players. We’re now building on this expertise in our next groundbreaking project: THE CREW 2. When will we be able to pre-order the game? We’re officially introducing our pre-order offer for The Crew 2 this week at Gamescom. Players who pre-order the game before its release on March 16th, 2018 will get The Legendary Motors Pack. This includes exclusive access for one month to two prestigious vehicles: the Mercedes-AMG C 63 Touring Car 2016 and HARLEY-DAVIDSON® IRON 883™ 2017. The Crew 2 has a large variety of gameplays, how do they all fit in the same world? Actually, it’s more like the other way around: our world is specifically designed so that all disciplines would have its perfect terrain. We considered this gameplay variety early on in the creation of Motornation: what are the specific needs of each discipline, what kind of environment would provide the best experience, how can we make it more enjoyable and surprising? For example, our new take on Street Racing had us completely rethink the way we explore US cities. With competitions going on in the open, we needed the urban environment to be 100% suitable to drive on – preferably full speed. Hence the many shortcuts, ramps, rooftop lanes and breakable street furniture. Pro Racing disciplines, on the other hand, are about finding the best line to break speed records. So each curve’s design counts, every detail about the track (if we’re talking about the single-seater Alpha Grand Prix) or the waves (when racing a PowerBoat) is of utmost importance. You’ll find that every challenge is meant for a dedicated vehicle type and is set in the perfect conditions for players to get a real kick out of it. The colossal size and variety of our open world allows us to be really creative, so we’re not done surprising you! What are the major challenges your team had to face in terms of graphics and sound design? Providing the best quality of graphics is one of our top priorities in THE CREW 2. On all aspects, the game is on par with the highest standards in textures realism, lighting, sound and definition. All our vehicles are 100% faithful to the real models, and we’ve made sure every car, bike, boat or plane looks amazing from every angle, including behind the wheel, with high fidelity sound. Every vehicle, every place and every motorsport family has its own sound signature and identity. Our other great endeavor on this subject is of course our huge open world. It is a country that looks and feels real, a beautiful and living place, more immersive. With the introduction of boats and planes, players will be able to fully explore it, from all perspectives. The cities offer beautiful skylines as well as breathtaking light reflection and night lights on skyscrapers. We’ve also worked hard to recreate lush and life-like vegetation, 3D volumetric clouds and fog and a perfectly realistic water behavior. There is no aspect of this world that hasn’t been pushed to its limits graphically. How many motorsports disciplines will there be? What kind of challenges can we expect? We’ve already introduced 5 disciplines available in THE CREW 2 this year at E3: Street Racing, Power Boat racing, Air race, Jet Sprint and Rally Raid. This week at Gamescom, we’re revealing 3 more disciplines: Drift, Motocross and the single-seater race Alpha Grand Prix. There’s, of course, a lot more coming. What are the differences between the car/bike/boat/plane gameplays? In THE CREW 2, we strike a balance between realism and accessibility. We’re aiming to offer a wide range of diverse gameplays but also want them to be fun and user-friendly. Each vehicle, and of course each vehicle type, has its own specific handling characteristics. You don’t drive a car like you would a bike, a boat or a plane in real-life, so we’ve recreated the driving and piloting sensations as vividly as possible. Every vehicle is carefully adjusted and tweaked to make sure its handling is as true to the original as possible. For example, our buggy’s bouncy suspensions are just perfect for off-road sessions, while the jet sprint is extremely responsive so you can handle the most treacherous curves on swampy water. What is the Fast Fav feature? 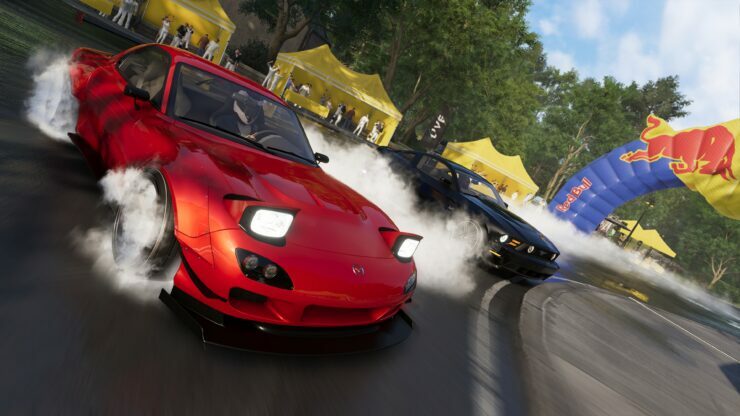 The Photo and Video Mode were pretty popular features in THE CREW. Are you bringing them back in THE CREW 2? LiveTrack records the last 10 minutes of the player’s actions in-the game, highlighting every feat. LiveReplay allows the player to watch a frantic video clip of one selected wow moment, choosing from a selection of preset cameras automatically generated by the game. Will players be able to customize their rides? Yes – both aesthetics and mechanics will be customizable on all vehicles in THE CREW 2. We will share more details in the coming months. Player progression in THE CREW 2 depends on one unique XP scale: fame. There are many ways to earn fame points, from completing story missions to taking one-shot challenges, exploring the world or even improvising tricks anywhere on the map. This allows players to have total freedom over how they want to become a champion, whether it’s by succeeding in official competitions or playing underdog. Are you partnering with new vehicles licensors for TC2? Yes, many new vehicles and manufacturers will join the lineup compared to THE CREW. At Gamescom, we are particularly excited to announce our first year-long and exclusive partnership with Harley Davidson.This is a prestigious brand that perfectly fits THE CREW 2 vision. Our players’ love for American motors and road trips will be thrilled by the integration of H-D iconic motorbikes! We’ve announced other great brands featured in THE CREW 2: Porsche and Audi to name a few. Planes and boats manufacturers are new comers to the license as well, like Zivko and DCB. We’ll keep revealing new exciting partnerships along the coming months. Is an online connection mandatory? THE CREW 2 is set in a living-breathing world of challenges and shared opportunities, tailored for seamless gaming. Online connection is mandatory because it’s a key element to the core experience of the game. Can you present the specificities of multiplayer in THE CREW? THE CREW 2 benefits from a huge open world and the widest range of vehicle types. This holds great potential for multiplayer fun and unexpected multi-vehicle interactions. Players will be able to join a 4-player crew with total freedom on their vehicle choice: all kinds of cars, bikes, boats and planes gather for some crazy freestyle sessions and take off to explore the whole USA from all perspectives. There will be PvP in THE CREW 2, and we’ll be giving more details about the whole system very soon. Will there be new content? How often? What type of new content? Do you plan to launch DLC with different maps? We’ve been committed to renew and expand the game experience through events, features, patches and expansions over the past two years with The Crew. This unique mindset has earned us a strong and trusting community of more than 12 million players. It is part of our franchise’s DNA and we intend to keep it that way. However, we are now focusing on delivering the best experience in THE CREW 2 at launch, so be sure to stay tuned for more details. What is The Crew Rewards Program? We are very excited to present our 12 million players community with THE CREW 2. But it’s also important for us to thank them for these past two years of support and feedback. That’s why, first of all, we are offering ALL The Crew owners the iconic FERRARI 458 SPECIALE 2014. Then, thanks to The Crew Rewards Program, all THE CREW 1 players – current, past or to come – will be able to unlock up to 18 vehicles on THE CREW 2 thanks to their in-game achievements. Last June, we’ve started unveiling two awards per month, and we’ll keep going until the end of the year. Each one will consist of a specific Action to perform in THE CREW and an associated THE CREW 2 vehicle as a reward. Right now in THE CREW, players can unlock no less than 7 vehicles: the FORD MUSTANG GT 2015, the DUCATI DIAVEL, the MASERATI GRAND TURISMO, the CHEVROLET CAMARO RS 1969, the INDIAN CHIEF DARK HORSE 2015, the KTM 450 RALLY and the HUMMER H1. Furthermore, all players who successfully complete 5, 10 or 15 of the listed Actions by THE CREW 2’s release date will also be rewarded with vehicles exclusive to the new game, starting with the Jet Sprint Proto Leopard. Are you planning any Live Phases? Yes, players can register now to have a chance to be the first to play at thecrewgame.com/beta.